Richard B. Russell Library for Political Research and Studies: Historical Forum Discussion (4/27/2012): Slavery or Freedom Forever? 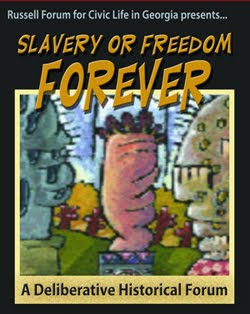 Historical Forum Discussion (4/27/2012): Slavery or Freedom Forever? Join the Russell Forum for a community forum on the historical crisis of American slavery, on Friday, April 27th from 3:30-5:00PM. With the help of trained neutral moderators, participants will weigh several approaches faced by Americans in 1854 for contending with slavery and its future in the United States and look closely at the values underlying these historical approaches. The group will also consider if and how these same underlying values inform American attitudes and approaches to tough public issues today. All are welcome to this free event! The forum will take place in room 258 of the Russell Special Collections Libraries building located at the corner of Waddell Street and South Hull Street (one block south of Broad Street and one block north of Baxter St.) Free event parking for off-campus attendees in the Hull Deck--enter off Baxter St. and take a ticket. A map to the event space can be found HERE. The Russell Building is fully accessible. Handicapped parking is available on all levels of the Hull Street Deck, located next to the Russell Building.